Be Inspired By This American Country Bathroom Design – Today, we have a wonderful bathroom inspiration for you to see. It’s sophisticated, with a clean and illuminated design, in which a light blue is a dominant shade, giving the bathroom a wonderfully relaxing ambiance, perfectly contrasting with the golden details from the chandelier, wall lamps, and mirror frames. It’s very romantic as well. So since we care a lot about you and giving you the best bathroom inspirations from the most luxury brands, don’t forget to see our Editor’s choice for you to see how to get a similar bathroom design. If you feel inspired by this wonderful American Country Bathroom, take a look at our Editor’s Choice. CROSS GREY SURFACE FROM MAISON VALENTINA | The crossing of different tones of grey, smoother or darker, gave birth this artistic art panel. This Cross Grey surface is based on the use of acrylic colors assortment and resin materials which blended with digital art and handmade techniques allow the creation of distinctive elements and repeated patterns. The art panels can be customized through graphic and handmade artistic touches and created in different sizes to create unique ambiences for the bathroom. This surface works really well with marble bathroom furniture due to is tones that resembled the Carrara marble effect. MORE INFO! BURJ CHANDELIER FROM LUXXU | Burj chandelier is inspired by one of the most stunning hotels in the world, the Burj Al Arab. Like the hotel, this masterpiece is a symbol of modern age and luxury combined. 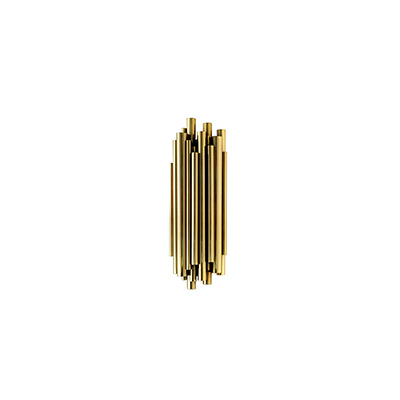 It’s also a strong, decorative structure, fully made of gold plated brass, with a delicately handmade glass tubes. MORE INFO! COLOSSEUM MIRROR FROM MAISON VALENTINA | The Colosseum or Coliseum, also known as the Flavian Amphitheatre, is an oval amphitheater in the center of the city of Rome, Italy. With an elongated shape, the Colosseum mirror has a fusion of modernistic and classical elements depicted in the golden arches which turn this into an exquisite design piece and a perfect accessory for a luxury bathroom. MORE INFO! NIKU WALL LIGHT FROM MAISON VALENTINA | NIKU, diminutive of Nikumaroro, is part of a Kiribati islands group, known as the Phoenix Islands. Surrounded by the depths of the Pacific Ocean, is the beauty of the coral that makes NIKU wall light a rarity in lighting. Through its GOLD plated brass structure, 2 spheres emerge representing the wide diversity of ecosystems that inhabit this remote island. NIKU wall light fills your bathroom with exoticism and brings it a live and bright ambience. MORE INFO! Nº20 ARMCHAIR FROM MAISON VALENTINA | Symbol of knowledge and rebirth, No 20 Armchair was raise through a long journey of a total set of 24 prototypes intended to reinterpret the forces of nature. No 20 distinguishes itself for its attitude represented in its fabric, a beautiful and standing out blue twill, and structure that embraces us with strength and determination, like Mother Nature. Imagine experience that in your own bathroom. MORE INFO!